We wanted to be sure that the first stop on our epic craft beer road trip of California was ‘where it all started’. Where the taper on the modern beer movement was lit. Where Cascade hops were first popularised in a pale ale. 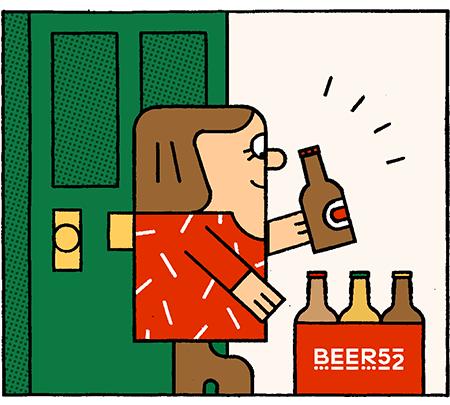 Where the beer that turned so many of us on to the possibility of what beer could be, and especially American beer, was brewed. The first stop on our trip positively, absolutely, had to be Sierra Nevada Brewing Co. And so, on a scorching hot 40-degree summer day, we get out of our air-conditioned car and into the car park of what some commentators have described fondly as ‘Malt Disneyland’, partly because of the impressive scale of the operation, but also since it inhabits a special place in every beer drinker’s mind. For many, Sierra Nevada’s flagship Pale Ale was the first hop-forward, flavourful beer they’d ever tasted. It laid the foundations for so much that has followed. And I think the brewery received the ‘Malt Disney’ moniker among beer bloggers and locals alike, not because of any tacky rides or attractions, but because its founder, Ken Grossman, is a visionary trailblazer of the same ilk as Disney himself. This is a person who, as a young man, learned to weld so that he could construct his own brew kit by hand, because at the time small-scale brew kits weren’t easily available. The market at the time only catered to homebrewers or macro-brewers, not the emerging breed of micro-breweries in between. We’re also talking about a man who, when the time came to scale-up, flew to Germany himself to dismantle a defunct all-copper brew house with his own hands, ultimately re-assembling it back home in Chico. The control panel still, to this day, is in German. The story goes that a neighbour of teenaged Ken had a garage that was a veritable treasure trove for this inventive teenager. As a retired rocket scientist, there was always some kind of project underway at Cal’s place. And, fortuitously for Ken, that often included home brewing. Having learned the basics in the garage, he soon moved out of there and, for the rest of high school, homebrewed himself, ultimately becoming engrossed in the hobby. Later opening a home brew store of his own, his path was set. Founded officially in 1980, Sierra Nevada went on to become the seventh largest brewery (and third largest craft brewery) in the US. Ken’s children, Brian and Sierra, are nowadays heavily involved in the business and are set to take over the reins when their father retires. A multigenerational craft brewer, with a profound legacy, Sierra Nevada is a billion-dollar company. And what’s supremely cool about it is that it’s still entirely independently owned by Ken and his family. The more time goes by, with smaller producers being bought out left, right and centre, the more special that fact becomes. Taking a break from our tour of the brewery, we get a chance to talk with brewmaster Sean Lavery in the head office, about some of the exciting projects that will help Sierra Nevada bring new styles of beer to drinkers. Despite how well-established they are, Sierra Nevada is not shy of continuing to push the boundaries, try new things and foster interesting partnerships with much smaller collaborators. Working on these projects represents a whole new era for the company’s brewers. As the newly-appointed brewmaster, following on from the 34-year tenure of Steve Dressler, Sean talks with visible excitement about the chance he has been given to build on this legacy. Sean will be working with the team to figure out how they can further improve every part of their process, both for the existing range and for new products. “How do we make sure that we capture some of the great, new hop flavours that are out there?” he ponders. He goes on to discuss how the brewery’s unique Torpedo process, designed and developed in-house, allows them to pass beer through full cone hops, extracting as many of their incredible flavours as possible. It’s clear to see that this is a group of people who are passionate about where they are based, the beers they make and what innovations they can bring to the table. Getting back into our car for the next leg of our road trip, we leave feeling inspired. Having visited one of the most iconic breweries in the world, we got a strong sense that this was far from a museum. The Grossman family and the brewers here have a lot of ambitions for the future and we look forward to tasting some of their latest collaborations later on in our trip, when we get down South to their ‘Beer Camp’ event in Long Beach.